Xiaomi MI Account Remover is a application for windows computer , which allows you to Unlock the Xiaomi account and do the factory reset it support 9008 Mode and fastboot Mode this is a very useful tool for Xiaomi users and for all mobile technicians, Xiaomi MI Account Remover Its latest version is released and available for directly download from our website. If you are interested into download the latest Xiaomi MI Account Remover than simply follow the link given at the bottom. It is free to download and very easy to use. So download and enjoy the new Xiaomi MI Account Remover on your PC. Disclaimer : Please read the terms and conditions carefully before using Xiaomi MI Account Remover Use of this software indicates you accept the terms of this license agreement and warranty. Xiaomi MI Account Remover (this software) is provided "as-is" and without warranty of any kind, express, implied or otherwise, including without limitation, any warranty of merchantability or fitness for a particular purpose. In no event shall the author of this software be held liable for data loss, damages, loss of profits or any other kind of loss while using or misusing this software. How to Use: Setting this up is very easy. once downloaded, navigate to your download folder. once that is do…I have attached the setup file into the archive. Just extract it with any RAR Extractor like WinRAR or WinZip or 7Zip. After extracting both files on same directory. Install Xiaomi Account remover Setup on your computer run Xiaomi account remover tool with administrator privilege, and that’s all it will open a new window with all necessary features. If you encountered any problem, feel free to ask just leave a comment and I will answer it as soon as I can. If you find this blog helpful please share it to your friends. 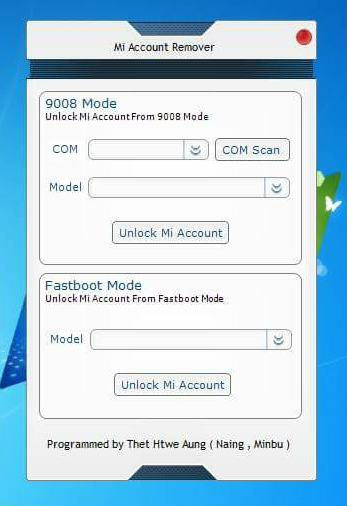 License: Xiaomi MI Account Remover is freeware Utility Tool . You may try it free for always. Copyright ©: Xiaomi MI Account Remover All rights reserved.